Two destructive wars in Mozambique – the 1964-74 War of Independence and the 1977-92 civil war – rendered the country among the poorest in the world in 1992. 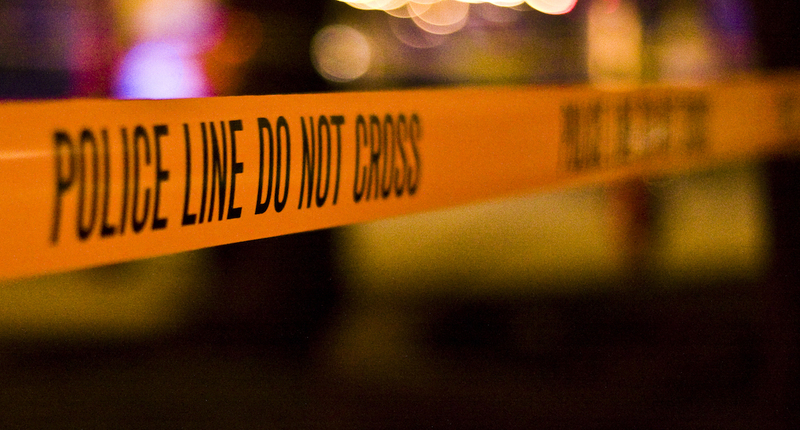 Besides widespread poverty, its population of roughly 15 million people had experienced high levels of fatalities and rampant violence against civilians, with approximately 4.5 million refugees and internally displaced. An early Human Rights Watch report, titled Conspicuous Destruction, painted a bleak picture: "parts of the country had returned to the Stone Age and Mozambique has to be built from scratch". On top of the challenges that fragile states face in order to recover post conflict, Mozambique also grappled with the lasting consequences of landmines, which were used extensively by all warring parties during the conflict era. Hundreds of thousands of landmines and unexploded ordnance dotted Mozambique’s vast territory. In a recent paper (Chiovelli et al. 2018), we quantify the local and economy-wide effects of landmine clearance in Mozambique, the only country to date that has transitioned successfully from a status of “heavily affected by landmines” to “landmine-free”. 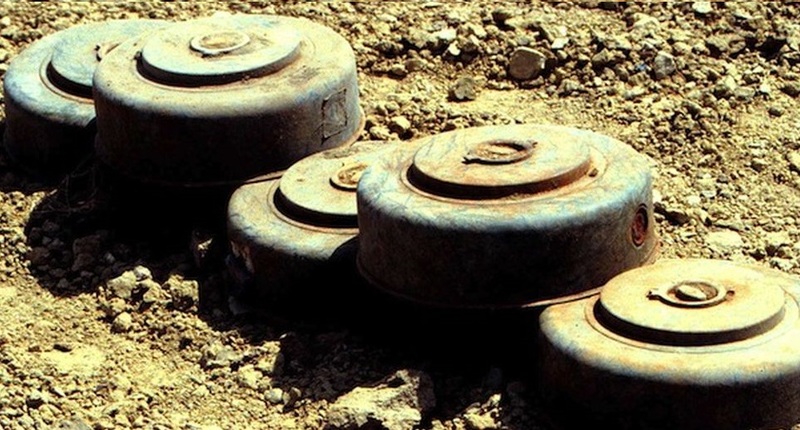 Although landmines and improvised explosive devices affect the lives of people in more than 50 countries and are currently used in many countries (most notably in Syria, Libya, Iraq, Yemen, and Myanmar), there is surprisingly little research on this topic. There are no centralised databases on landmine clearance operations, as the process is highly fragmented and typically not centrally planned or coordinated. Hence, our first task was to collect and verify information on landmine and unexploded ordnance clearance operations between 1992 and 2015 from the multitude of NGOs, governmental agencies, commercial operators, and UN agencies that were involved in this process. We are able to provide for the first time an almost complete documentation of clearance operations for any landmine-contaminated country in the world. The left-hand panel in the video below portrays the evolution of the clearance of 7,423 confirmed hazardous areas, containing hundreds of thousands of mines (we provide more detailed mappings at www.land-mines.com). In 1992, mines were found in all provinces and in more than 80% of Mozambican districts (admin-3 units). Our quantification of the correlates of mines fits with existing historical evidence. Mines blocked access to roads and railroads. The border areas with Zimbabwe, Tanzania, and South Africa were heavily mined during the wars, and mines were also placed in towns outside schools, townhalls, and state buildings that were used as local military headquarters. Dams, electricity pylons, factories, and farms were also often mined by rebels, militias, thugs, and the army during the various phases of the warfare. In line with interviews with practitioners and the historical narrative on the localised and fragmented nature of clearance operations, we find that the timing of demining is weakly related to geographic, location, and economic characteristics. We then exploit variation in the timing of demining across 1,187 localities (admin-4 units) –which was largely uncoordinated and not strategically planned in the early decade – to assess the impact of clearance on local economic activity. To bypass the absence of output statistics at the local level (particularly for the period preceding the clearance operations), we proxy for regional development/urbanisation using satellite images of light density at night that are available at a fine regional scale and are known to proxy for local economic activity (Michalopolous and Papaioannou 2017). The right-hand panel in video below gives the evolution of luminosity in the country over the period 1992-2015. We compare Mozambican localities, where demining was completed in a given period/year, to those localities that were either not contaminated by landmines or were mined but had not yet cleared. 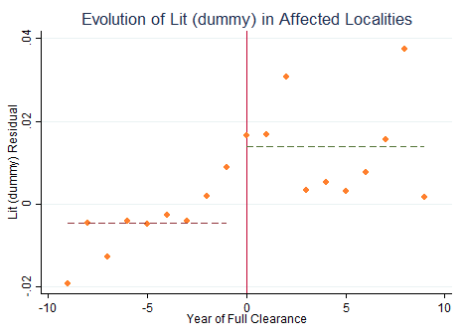 As Figure 1 illustrates, the before/after analysis reveals that economic activity picks up modestly upon full clearance from landmine contamination. Note that the average duration of clearing a locality is about six years. 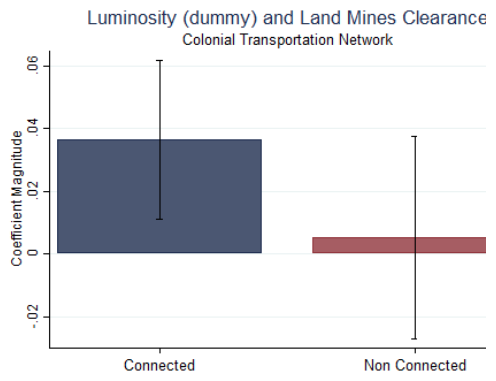 Hence, the graphical illustration (and the associated econometric analysis) suggests that local economic activity starts responding to local demining operations as early as two years before complete demining. We then ask whether clearing different types of minefields/localities moderates or magnifies the impact of demining on local development. Demining interventions in rural, low-population-density areas close to borders have no readily discernible impact on local development (as captured by images of satellite density). In contrast, demining is followed by significant increases in luminosity in more densely populated localities, regions hosting local trade hubs, and when demining targets paved roads and railroads. Figure 2 summarises the uncovered sizable variation (heterogeneity). 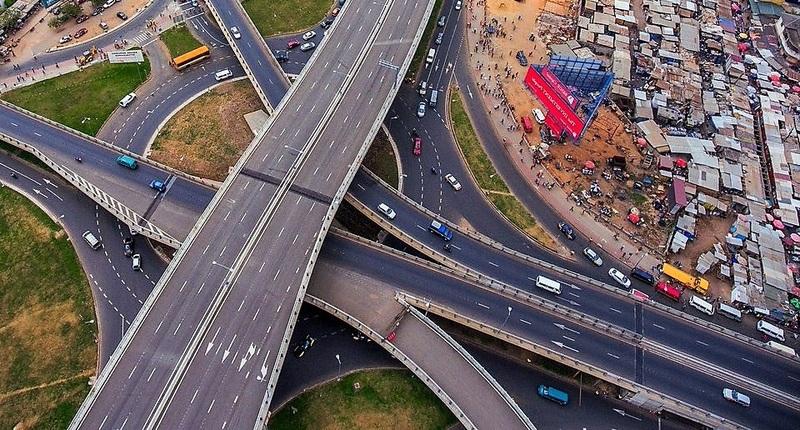 The uncovered variation indicates that clearing transportation infrastructure and local trade hubs may have spillover effects on interconnected districts. Therefore, we examine the economy-wide implications of landmine clearance employing an economic theory grounded econometric approach that quantifies both the direct and indirect effects of landmine clearance (Donaldson and Hornbeck 2016). 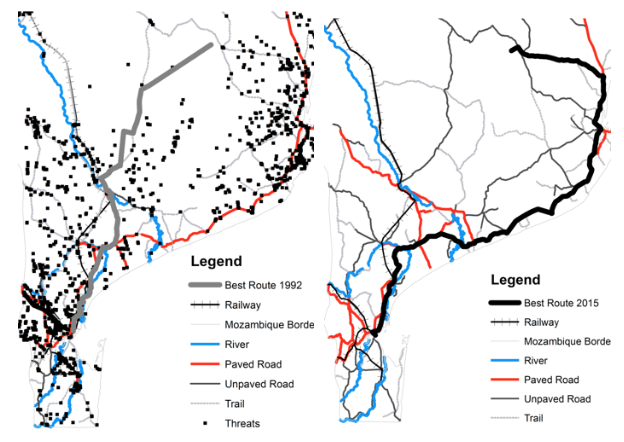 Using an algorithm that connects each Mozambican locality to all other localities in every period via the pre-war transportation network, we approximate localities’ ‘market access’ with and without landmines. The figures below provide an example of least-cost travel from Funhalouro to the capital city of Maputo in 1992 when the transportation network was heavily mined and in 2015 when all contamination was removed. We then associate changes in regional development/urbanisation to ‘market-access’ changes due to demining across the country. The estimates reveal economically large and precisely estimated effects of landmine and unexploded ordnance removal on aggregate economic activity. 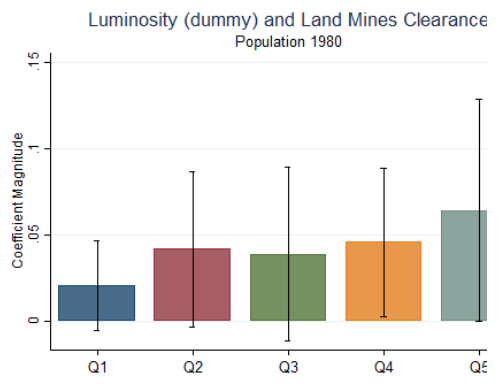 We find large spillover effects, demonstrated by highly significant change in luminosity even in localities that were not contaminated by mines. 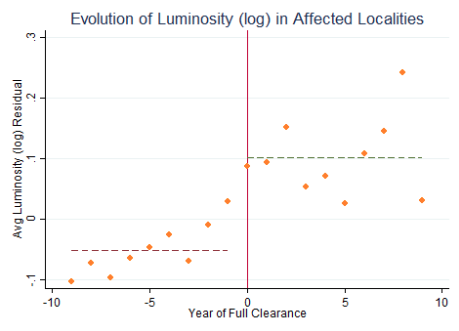 The association between localities’ market access and luminosity is also strong when we look at clearance interventions targeting the at-independence infrastructure network and imposing the pre-civil-war distribution of the population. These results point out that due to positive spillovers, the economy-wide effects of landmine clearance are much larger than the local effects. The likely economic gains of demining. We estimate that Mozambique’s GDP per capita in 2015 would be roughly 18%-25% lower in the extreme case of no clearance. The losses associated with the fragmented and uncoordinated manner that characterised mine clearance. The policy simulations reveal significant losses in the absence of central planning and strategic coordination among the various demining operators. This is because in the early phases of demining, Mozambique cleared border areas and rural regions rather than infrastructure/network/central localities or local urban hubs. Our results suggest that governments, policymakers, and demining operators should factor significant spillovers into their decision making. Central planning and coordination are needed, since from an economic standpoint it may be more beneficial to unblock the transportation network rather than clear border and rural areas that are often prioritised. 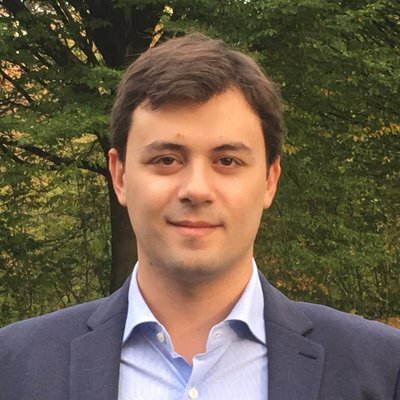 Of course, district prioritisation is in practice quite a complex process that has to take into consideration many factors, such as the return of refugees, boosting local morale, and restoring a sense of security. But economic potential – which is substantial in towns and cities – should be one of these factors. Finally, our finding that demining local trade hubs and freeing roads and railroads entails large economic benefits carries a lesson for the international community and leaders that are considering the extension of the Mine Ban Treaty on anti-personnel landmines to cover anti-tank (and anti-vehicle) landmines. 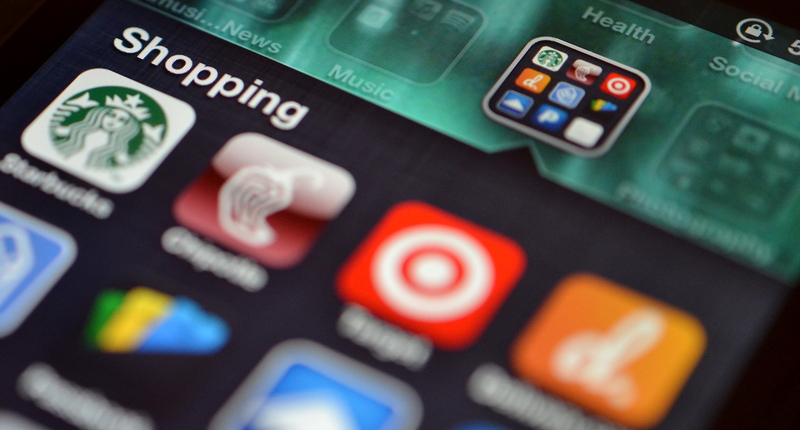 Their use by debilitating the transportation network hinders economic recovery, as economic development is – to a great extent – fueled by intra-region flow in goods, people, and ideas. Editor’s note: The article is based on the PEDL project “The Effects of Land Mines on Development and Entrepreneurship: Evidence from Mozambique”. Donaldson, D and R Hornbeck (2016), “Railroads and American economic growth: a “Market Access” approach, Quarterly Journal of Economics 131(2): 799-858. 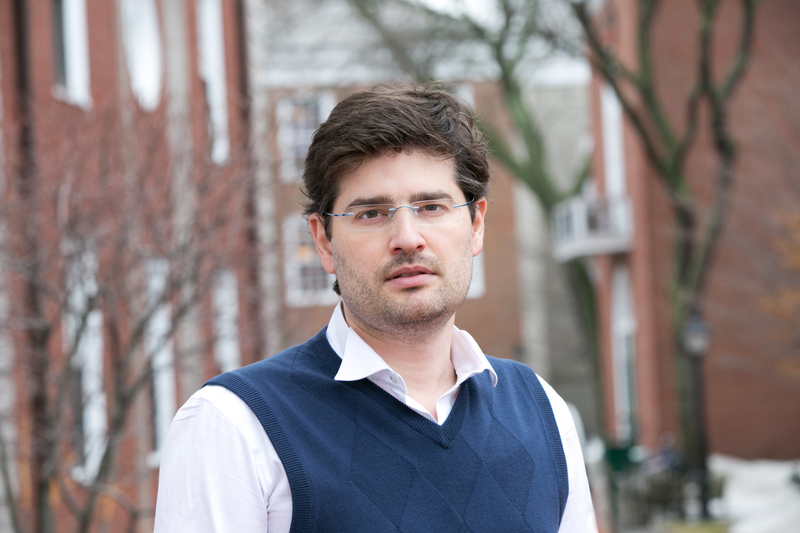 Michalopoulos, S and E Papaioannou (2018), “Spatial patterns of development: A meso approach”, NBER Working Paper 24088.